The good news for the Jaguars is that that winning season took them to the AFC Championship Game, and it was only a season ago, and most of the pieces from that team are still around, so it’s not currently a lost cause. But there is work to be done. Let’s take a look at the best Jaguars fantasy seasons of the last decade. 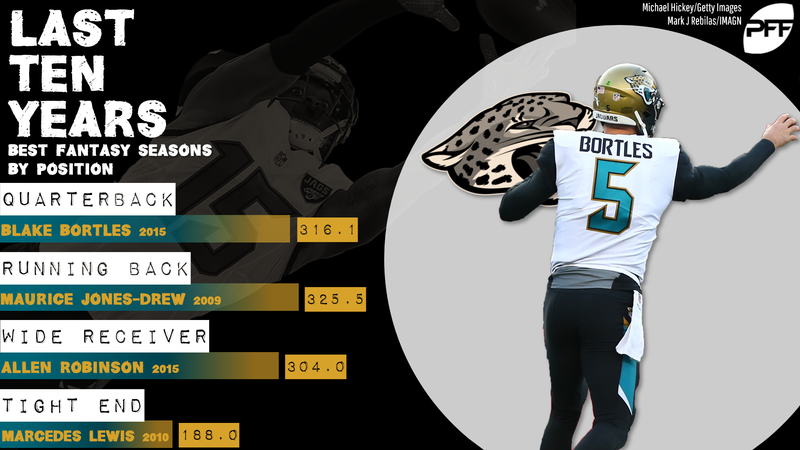 The days of Mark Brunell and Byron Leftwich came before our 10-year sample here, but even with those, Bortles’ big 2015 stands as the best fantasy QB year in the Jaguars’ relatively short history. And while Bortles has never been exactly good as a real quarterback, his lofty ranking in 2015 was totally earned, in large part because of his massive success throwing the deep ball. He passed for 1,331 yards on targets 20-plus yards downfield with a 106.3 passer rating in 2015; in the three years since, he’s totaled 1,475 deep yards on a 49.9 passer rating. His 2015 was great; not much else has been. I bet, if pressed, you would have guessed Leonard Fournette’s rookie season of 2017, only talking yourself out of it when you remembered Fournette missed three games that year. Well, Fournette had a good year in 2017 … and finished nearly 100 full points behind Jones-Drew’s 2009 (and behind his 2010 and 2011 as well). Jones-Drew was a stud for the first six years of his career … then got hurt in 2012 and was done in 2014. Running backs burn bright and fast. It tickles me that Lewis and Jones-Drew were literally college teammates at UCLA, got drafted the same year by the Jaguars, and spent eight years as teammates there. You just don’t see pairings last that long. But while Jones-Drew’s career ended in 2014, Lewis is still playing, albeit not much — he had all of three receptions last year with Green Bay. In 2010, though, Lewis was at his best. He set career-bests in receptions, yards, and touchdowns, marks that, about to turn 35 and not long for the league, I’m going to guess he never betters.